With the state conference coming up I wanted to pass along some important information from national’s. If you have any question about the up coming national conference please see me this week at the state conference or email me dmoll [at] patsa.org (.) Have a great state conference. 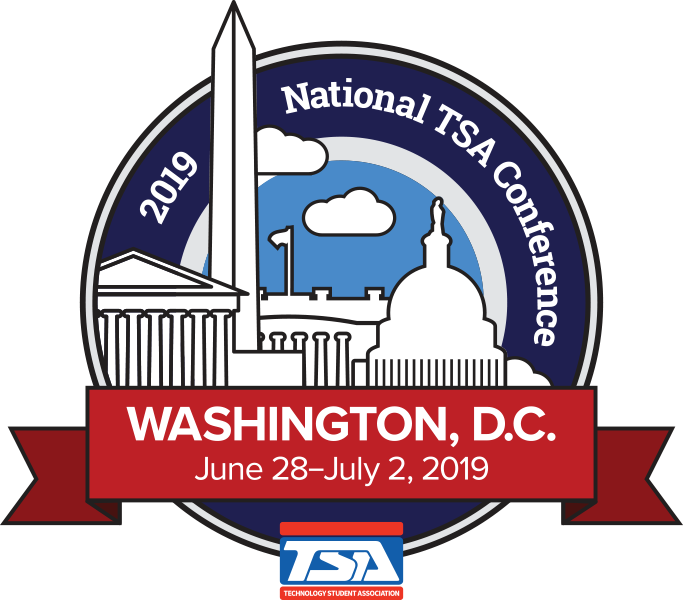 Online registration for the 2019 National TSA Conference, June 28-July 2, 2019 at the Gaylord National Resort, National Harbor, MD (near Washington, DC) is now open. Prior to submitting competitors for the State Qualifier Events student must be registered for the conference. Online reservations for hotels for the 2019 National TSA Conference may be made at this link. Canceling any room reservation (individual or group) after April 15, 2019, will result in a two-night rate and tax penalty charged to the credit card on file per canceled room. Contact Conference Manager, kgulich [at] tsaweb.org" rel="noopener noreferrer" shape="rect" style="margin:0px; padding:0px; border:0px; font:inherit; vertical-align:baseline; color:blue; text-decoration:underline" target="_blank">Kelly Gulich, with any questions. TSA’s Cybersecurity competition is a Capture The Flag (CTF) competition and is offered to 2018-2019 affiliated high school chapters. Chapters will register teams and participate against other chapters virtually, and to prepare for the on-site contest at the national TSA conference. Chapters will be able to track their progress/scores via an on-line scoreboard. There is no state-level Cybersecurity Competition offered in 2019. TSA intends to offer the Cybersecurity event at the state level in 2020. State and chapter advisors will be notified in early April when the competition is available viaTSAweb.org. The Technology Student Association’s CompTIA IT Fundaments+ Certification competition will be offered to a limited number of currently affiliated high school student members who will be attending the 2019 National TSA Conference in Washington, D.C. CompTIA’s ITF is an introduction to basic IT knowledge and skills that form the basis for a foundational understanding of careers within the Information Technology field. CompTIA is offering the ITF+ certification exam at no cost to a limited number of students. Up to three students per chapter will be able to register to take the ITF+ certification test at the 2019 National TSA Conference. There is no state-level ITF+ Certification Competition offered in 2019. Contact lhaitz [at] tsaweb.org" rel="noopener noreferrer" shape="rect" style="margin:0px; padding:0px; border:0px; font:inherit; vertical-align:baseline; color:blue; text-decoration:underline" target="_blank">Lynda Haitz with questions. This is a reminder to review and share the General Rules and Regulations with all participants competing in TSA competitive events. Important topics covered include, but are not limited to: Citations, References, and Copyrighted Material, Prohibited Materials, References, and Images, and the Process for Rules Violations and Disqualifications. The National TSA Alumni Association has established a $1,000 scholarship to be awarded annually to a TSA alumnus. The scholarship award will be in recognition of the hard work and dedication of a TSA alumnus who has continued to give back to TSA beyond their time as a competitor. The scholarship application will be available on the TSA website on April 1, 2019. TSA VEX competitions are state advisor approval events. TSA VEX teams that qualify to advance, either for VRC or VIQC, will be slotted by state advisors for the 2019 national TSA conference in National Harbor, Maryland. States may advance three (3) VRC teams (high school/middle school) and three (3) VIQC teams (middle school only). Teams that participate at the state level - but do not rank in the initial top three (3) for VRC or VIQC, may be added to a waitlist by state advisor when they slot their state advisor approval events. National TSA will inform waitlisted teams of their eligibility to advance to the 2019 national TSA conference. Please note that teams that did not meet the March 1st deadline to register their team onrobotevents.com are not eligible to compete at the 2019 National TSA Conference. Contact jcabahug [at] tsaweb.org" rel="noopener noreferrer" shape="rect" style="margin:0px; padding:0px; border:0px; font:inherit; vertical-align:baseline; color:blue; text-decoration:underline" target="_blank">Janice Cabahug with any questions. For middle school events, there are two separate LEAP template forms—team and individual. For high school events, there is one LEAP form and contestants indicate either team or individual in the designated space on the form. Contact lhaitz [at] tsaweb.org" rel="noopener noreferrer" shape="rect" style="margin:0px; padding:0px; border:0px; font:inherit; vertical-align:baseline; color:blue; text-decoration:underline" target="_blank">Lynda Haitz with any questions. Many TSA chapters have not yet completed their membership rosters for this school year. In order to compete at state or national TSA events, member names must be entered on chapter rosters. Be sure to remind chapter advisors in your state to complete their rosters if they have not yet done so. Chapter advisors can either enter names individually or upload members from a spreadsheet. Contact lguido [at] tsaweb.org" rel="noopener noreferrer" shape="rect" style="margin:0px; padding:0px; border:0px; font:inherit; vertical-align:baseline; color:blue; text-decoration:underline" target="_blank">Leanne Guido with questions or for assistance in uploading rosters.